A collection of pictures with the title “Me and the War” from the Terezin Memorial competitions in 2009 was on display in the Information Centre in Kravare near Ceska Lipa starting 6th May 2011. On that day the exhibition opening took place in the Information Centre. The opening programme, which had been prepared by the local school pupils under the guidance of Mgr. Hana Tesarkova, involved also reciting poems by Hanus Hachenburg, a child prisoner of the Terezin ghetto. The exhibition remained in Kravare over the summer holidays. In October 2011, this exhibition was installed in the Municipal Library in Louny, and then in the Rakovnik Museum in the Samson Gallery space. Later it could also be appreciated by visitors of Rakovnik Museum branch at Jesenice. 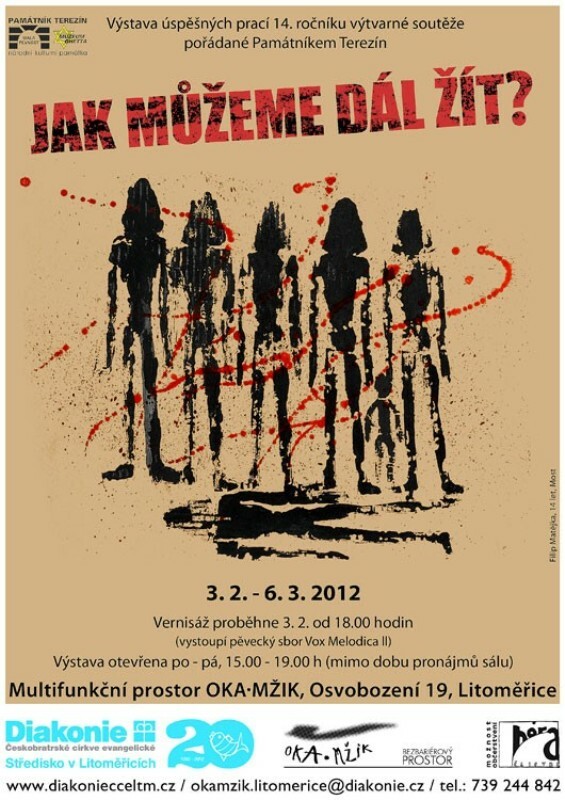 On 12th March 2012, a ceremonial opening of the same exhibition was held at the Department for Education and Culture of the Jewish Museum in Prague. The gala evening was also very enjoyable thanks to the guitar trio Altera Pars, which played the compositions by J. S. Bach and P. Hindemith. How Can We Live On? The most interesting works from the competition in 2010 under the title How Can We Live On? were first presented outside Terezin in the Jewish community in Teplice in September 2011. Another display of these art works took place at the Evangelic Choir in Most. The exhibition opening went on in November 2011 in the presence of Mrs. Erna Chaloupkova, former Terezin Ghetto prisoner living now in Moscow. The exposition later moved from Most to Diacony Oka-mzik in Litomerice. From early March 2012, the collection of drawings could be seen at funeral Jewish chapel in Louny.